We already covered the route. We already looked at the machines. Can you guess what's missing? Yes: people. The people inside and outside the race that make the Dakar what it is. 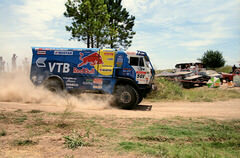 To take part of the Dakar it's not an easy challenge. The heat, the (very) long driving hours, the lack of sleep, require that men and women in the race have a strong physical and psychological preparation. 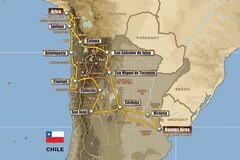 In the last post we looked a bit at the history behind the legend that it's the Dakar, and we toured around the South American route for the 2011 event. Now it's time to have a look at one of the most important aspects of the rally: the vehicles. Although the Dakar has pretty clear rules about categories and types of vehicles, there is actually very little limitation on what you can drive around the rally (as long as it's safe).